Good God and Lordy, people, is there anything more ludicrous on the political scene than what happens in Iowa whenever the Republicans don't have a Grand Poobah candidate for President? This year it was a big barbecue in Ames where just under 17,000 people 16 1/2 years old and over got to pay their $30 to "vote" for a candidate and then party afterward. Michele Bachmann and Ron Paul were the "winners". And, not surprisingly, the emperor wore no clothes. The main function of the Iowa Straw Poll is to draw in money for the Republican Party and for the towns in Iowa that hold the straw polls. That should be enough for those folks, but even given proof of the historical insignificance of the poll and it's non-role in the winning of presidencies, the press falls all over itself to turn it into something it's not now and never will be. As a political forecaster, it's record is pitiful. Rarely if ever does the Straw Poll winner win the Iowa Caucus, much less the presidency. So let's just get over the "importance" of yesterday's vote in Ames, Iowa and have a little fun with it, okay? Calling the results of today’s Iowa straw poll “alarming,” Standard and Poor’s took the unprecedented action of downgrading Iowa’s IQ. While the effects of such an extraordinary measure are hard to predict, experts say the IQ downgrade could result in Iowans having difficulty completing sentences or operating a television remote. 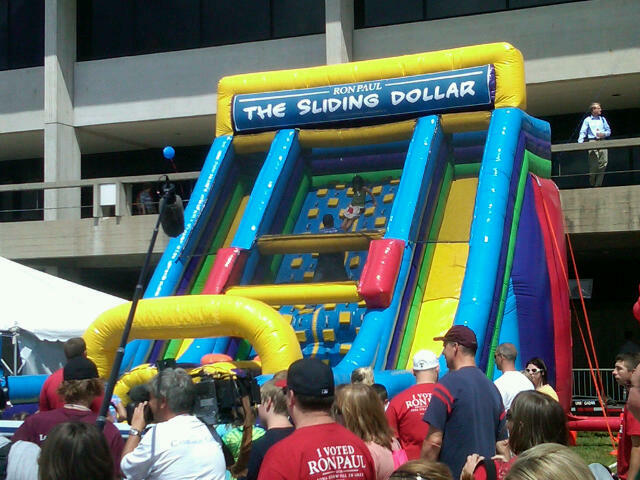 At the Fairgrounds, where the Big Barbecue was going on, Ron Paul had something called the "Prosperity Playground", where you could slide down the "Sliding Dollar" slide and just be a kid again. Ujala Sehgal writes about it and more in this piece in the Atlantic. Man, those kids had fun! 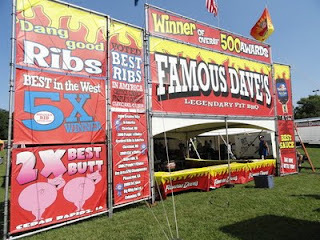 The Ames Patch took to judging the candidates' tent sizes. Thaddeus McCotter's may have been the smallest, at an embarrassing 30x30 feet, but Tim Pawlenty's took the prize as the largest, at 200 sq. 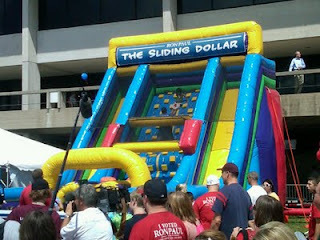 ft. over Michele Bachmann's 10,000 foot air-conditioned whopper. And here's a bonus. Marcus Bachmann with that same corn dog. I WILL NOT comment. No. I mustn't. But I will say this: What happens in Iowa should have the decency to stay in Iowa. Really. I think Pawlenty quit because he just can't stomach seeing Sarah Palin any more. Just imagine traveling around the US and having her pop up unpredictably next to you at the oddest moments. Yuck, do you blame him? lol. That could be. Or it could be that he's just so disillusioned after seeing that Bachmann and Paul bested him by miles. How embarrassing! But anyone who really wants to be president has to be able to take whatever comes. He didn't want it bad enough if something as goofy as the first Iowa Straw Poll knocks him for a loop..
Have to add this: Each Straw Poll voter was required to pay $30 for the privilege of voting for the Republican of their choice, but several of the candidates chose to pay the $30 fee for the voters. In my corner of the world that's as close to buying votes as it gets. The entire thing was a farce, yet it's taken seriously by every network, every newspaper, and nearly every political pundit in the country. We've probably lost the battle, folks. The only reality left to us is on those silly shows on TV.